Version 2.1 allows users to playback their videos on their mobile device while the Disklavier wirelessly reproduces every detail of their original performance. “Students can take a step back from the piano bench and watch themselves on their mobile device’s screen, while their piano’s keys and pedals magically move up and down to recreate their original performance wirelessly" - Russell Hirota, Yamaha. 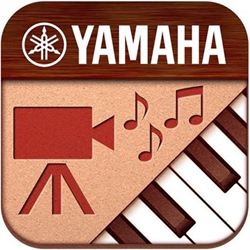 My Music Recorder, the easy-to-use iOS app designed by Yamaha for aspiring musicians to easily record, playback and share videos of their daily musical performances, has received an update that includes compatibility with, as well as wireless playback on the company’s Disklavier E3 and ENSPIRE reproducing pianos. For years, My Music Recorder has provided a handy and inspiring way for students, teachers and parents to keep track of practice times by recording videos with the built-in camera on an iPhone, iPad or iPod touch. The app motivates students to practice by counting the number of notes they play, and rewarding them with stamps; the longer they practice, the more stamps they can collect. Students can then share progress with friends and family by emailing video files of their performances, or by posting their achievements on YouTube. Version 2.1 now seamlessly integrates with both Yamaha Disklavier E3 and ENSPIRE reproducing pianos, allowing users to playback their videos on their mobile device while the Disklavier wirelessly reproduces every detail of their original performance. This state-of-the-art, wireless video sync technology is simple to use and only requires a Yamaha MD-BT01 or UD-BT01 Bluetooth MIDI adapter connected to the MIDI or USB HOST ports of the Disklavier.